Egg Production - B & M Slots Pty. 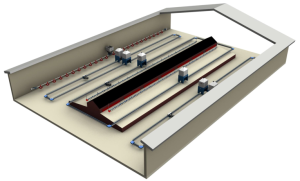 Ltd.
B & M Slots specializes in the design, supply and installation of systems for broiler breeders and commercial layers. Our range of products includes Jansen housing systems, VDL chain feeding, Lubing drinkers and egg conveyors, and Hotraco control and egg optimization systems. We have extensive experience in the design and installation of fertile egg production systems, with over 150 houses facilitated across Australia and New Zealand.